Monsoon rains seen very active over West-North western India as the prevailing wind flow are creating a favourable cyclonic vorticity triggering heavy rains over the area for the past few days and the said conditions would prevail and rainfall is likely to continue for the next few days and one or two places in Gujarat, Rajasthan might see isolated very heavy falls. On the other side, the upper air cyclonic circulation over Northeast Bay of Bengal and adjoining waters might become a significant low in next 3-4 days. Few parts of Chattisgarh, Odisha, Mizoram, Nagaland and Manipur would see heavy rains. Moving down south, most parts of interior TN and South TN continues to see above normal temperature. One or two places might see isolated heavy thundershowers. Chennai – Partly cloudy skies at day break. A warm day beckons the region. A high of 34 and a low of 27 degrees is expected. A stray shower cannot be ruled out. Coimbatore – A comfortable breezy morning on the cards. Turning slightly warm as the day wears on.. A high of 33 and a easy and comfortable night at 22 degrees. 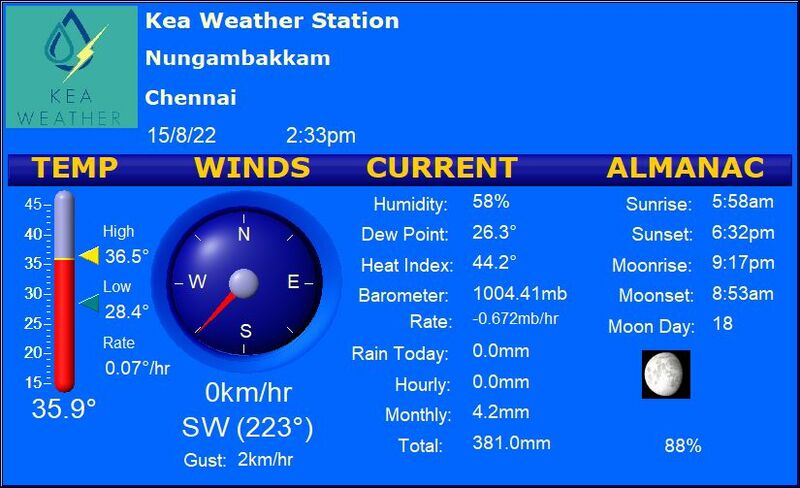 Madurai – Hot weather conditions continues to desist as above normal day highs seems to be the order of the day. Mercury to peak at 37 degrees with isolated evening Thunder showers over the area. Trichy – A scorcher of a day in prospect. Max temperature may peak at 38 degrees with a possibility of some late evening showers to cool things down. Vellore – A calm morning bereft of any breeze. A high of 32 degrees, thanks to few patchy cloud cover. A shower or two later in the day.